One of the coolest things about being a Nintendo 3DS owner is getting to see that little green light in the upper right-hand corner of your system blink into existence. It means you’ve StreetPassed with another 3DS owner, and his or her avatar is just one more to add to the growing population in your Mii garden. Ah, but what if your plaza is a barren wasteland? What if you seem to rarely encounter another 3DS in the wild? How can you get more StreetPasses on your Nintendo 3DS? There are a lot of lonely Nintendo 3DS systems out there, and they’re all dying for the chance to meet you. Here are a few tips for getting the most out of your StreetPass experience. The Nintendo 3DS’s StreetPass feature was designed with Japan’s dense cities in mind. Needless to say, the more people you pass by on your daily commute to work, the likelier it is that someone in the crowd will have a 3DS that’s dying to talk to yours. But if you live in a rural area, should you just shrug your shoulders and assume you’ll never catch a StreetPass? Nope! Don’t throw in the towel without a fight: With a little persistence, you’ll find your StreetPasses. 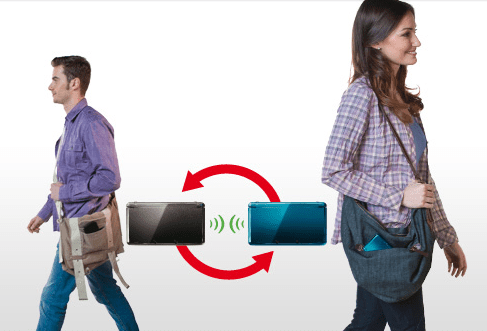 Take your 3DS with you wherever you go. Make it your new best friend. After all, it’s small and it doesn’t eat much. Put it in your purse, your satchel, your knapsack, your oversized paper bag—whatever you carry around with you when you’re out and about. The 3DS is an expert at sniffing out signals that pass by it at rapid speeds, so even whipping by another 3DS owner in a car might land you a StreetPass. Attending a public gathering? Don’t go without your 3DS. People that have a hard time picking up StreetPasses almost always make a point to bring their 3DS to big events, so don’t be left out. Make extra sure to bring your 3DS to game-related conventions (or related gatherings, such as comic books or anime conventions). You’re certain to score. Speaking personally, I grabbed over 300 StreetPasses at E3 2011. Your results may vary. You don’t need a Wi-Fi signal to utilize StreetPass, but your Wi-Fi signal does need to be turned on. Don’t forget! You can pick up StreetPasses when your 3DS is closed (in “sleep mode”). Even though your 3DS' battery drains very slowly when the system is closed, it can still run dry. Keep an eye on the lights on the bottom of your 3DS: If you see a red light beside your blue “Power On” beacon, you’re dangerously close to an automatic shutdown. No battery means no StreetPasses, which means you might miss out on a once-in-a-lifetime opportunity to gain a unique Mii. Speaking personally (again), a dead battery caused my husband to miss a StreetPass from legendary Nintendo employee Shigeru Miyamoto. Don’t let this sad event befall you. Keep your 3DS charged and ready. Garnering StreetPasses isn’t simply a matter of turning on your 3DS and going to town. The Miis you meet queue up at your Plaza gate ten at a time. Once there are ten, you can’t grab any other Miis via StreetPass until you work your way through the lineup at your front door. In other words, if you’re in an area with a lot of 3DS’s, be vigilant about checking in your Mii friends. Otherwise, you might go home with ten Miis when it was actually possible to meet hundreds. How Do I Set up Wi-Fi on My Nintendo 3DS XL? How Long Does the Nintendo 3DS Battery Usually Last? What's the Easiest Way to Download Nintendo 3DS Game Demos? What Comes in the Nintendo 3DS Box?